It’s almost that time again. Time for fellowship, food, fun, shopping and pure energy and love with beautiful, creative black people. The “Black Love Experience” at Nubian Hueman in Washington, D.C. is coming! This will be the fourth Black Love Experience (BLE) and it gets bigger and better every year. I’ve been to all of them and this event just keeps exceeding my expectations. The BLE manages to merge the power of Black History Month with the love-feelings of Valentine’s Day. The Nubian Hueman shop hosts the event which it describes as “one of the largest gatherings of Black artists and creatives in the area.” For one night, BLE takes over the Anacostia Arts Center and creates a standout experience that has something for everyone. The BLE is where fashion, art and music meet. At its core, the BLE is a unique shopping event where you can find handmade pieces and affordable yet one-of-a-kind trinkets. But, the night is so much more than that. It’s also filled with some of the most beautiful and interesting people. If you’ve never been, here are four reasons why you need to grab your ticket right now. You’ll find wares from artists and designers from around the world at the BLE. Nubian Hueman already has a diverse offering of clothing, jewelry and art from talented designers. But, BLE is shopping on steroids. Here are a few examples of some of the unique things you can find at the event. The night is a great blend of art, live entertainment, shopping and food. The event also features interactive sessions inside the Anacostia Arts Center (where the Nubian Hueman store is located) on topics like relationships and more. You’ll find artists creating things right on the spot. Photographer Shani Crowe, illustrator Llanakila and interactive artists Intellectucool will be among the featured artists this year. Here’s a taste of that live art and culture. In 2015, Markus Prime painted this beauty right on the spot. If you’re not in the mood to shop, then come for the live music. There’s always a DJ, singer or poet there to kick off the night right and keep the party going. DJ Underdog will provide the music again this year. In DC, people always seem to crave networking to help them level up in their careers. But, at the BLE, that’s not the main focus. Not that you can’t meet and build with new people, but this night isn’t solely a “who are you, what’s your job title and what can you do for me?” type of night. Instead, it’s more of a night of “nice to meet you… what’s your passion?” Or, “hey sis, love your hair,” which opens a dialogue that has nothing to do with typical DC status conversations. It’s more than a night to shop and dance, the BLE is a real opportunity to fellowship with people who look and love just like you. “It’s a congregation that goes deeper than male/female adoration. This is a moment of communal healing and has proven to resonate far past this night alone. It is loving us as Black people through various mediums and possess a kinetic energy that cannot be contrived or duplicated. You’ve got to feel it for yourself,” says BLE founder Anika Hobbs. 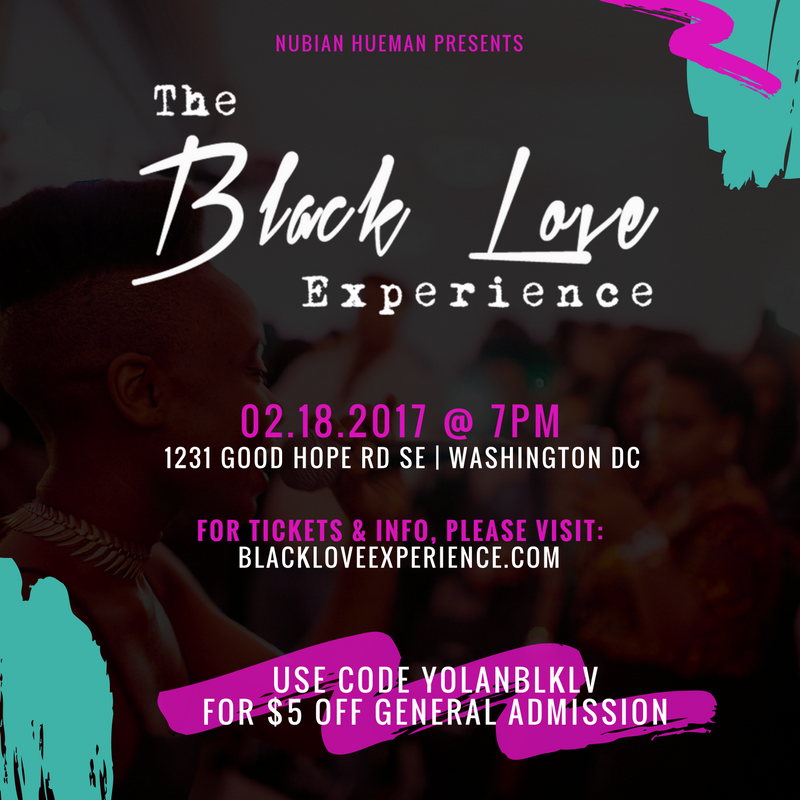 The Black Love Experience takes place starting at 7 pm on Feb. 18, 2017 at the Anacostia Arts Center (1231 Good Hope Road SE DC). A portion of the ticket proceeds will benefit local charities. Don’t sleep on getting your tickets. Last year’s BLE sold out. I’m proud to be an event ambassador this year, so use my discount code to grab your ticket here. My code is YOLANBLKLV and you’ll get $5 off admission. Follow #BlackLoveDC on social platforms for more on this event and to see pics from previous years and be sure to follow the Instagram page. I’ve got a few of my snaps below! Letting my inner queen shine. Posted up with Diana Ramsey of Sisters With Beauty. Team #blackandwhite with @sisterswithbeauty at the @nubianhueman #blacklovedc event. Follow her site for #naturalhair goodness! And, again at the 2015 event. With my social medialess😃 cousin at another great #BlackLoveDC. Great job, as always, @nubianhueman! So, will I see you at the Black Love Experience? 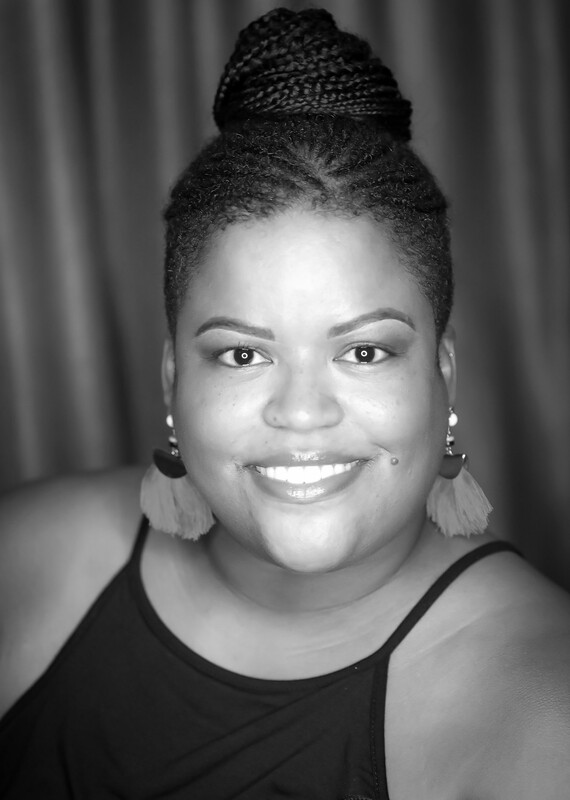 Yolanda R. Arrington is a digital storyteller from Washington, D.C. who helps brands break through the Internet’s noise and weave their stories into engaging and easily digestible online content. Great article! We thank you for being such an amazing supporter and ambassador. I help brands break through the Internet’s noise and weave their stories into engaging and easily digestible online content.